Imagine a farm where you are welcome to walk in its fields. You hear birds singing and see wildflowers blooming. The cows in the meadows are grazing and the children in farm school are learning-by-doing, collecting eggs from free-ranging chickens and picking fruit from orchard trees. 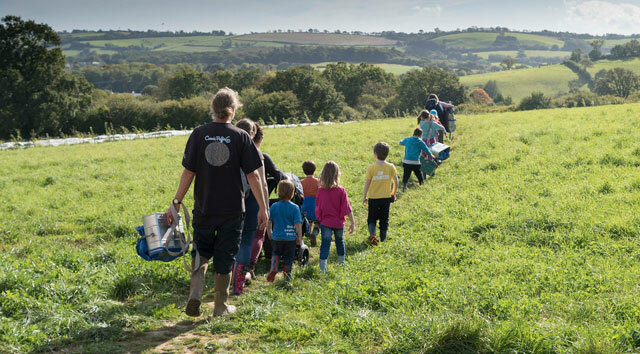 Welcome to community-owned Huxhams Cross Farm set on the rolling hills of south Devon on the edge of the Dartington Hall estate. Secured by the Biodynamic Land Trust (of which more later), its 34-acres exemplifies human-scale farming in a world increasingly dominated by industrial farming. Huxhams Cross Farm needs your investment and here’s why. In the UK and Europe, small farms are increasingly swallowed up by neighbouring industrial farms – 3% of farms own 52% of EU land. The UK currently imports over half the food it consumes with about a quarter coming from the EU. As for fresh produce, the UK imports 80% of its fresh vegetables and 40% of fresh fruit. The need for the UK to produce its own food is ever-more pressing post-Brexit. Coupled with a falling pound and potential tariffs, there could be significant price rises according to a joint food report from Universities of City, Cardiff and Sussex. Food growing is made harder in the UK due to land prices. It takes a farmer up to 20 years to pay back one hectare of land in the UK (compared for instance with nine years in the Netherlands and six in France). Because UK land is used as a financial safe haven, its prices have become inflated, putting farmland beyond the reach of farmers growing food. The Biodynamic Land Trust is working to de-commodify the land and return it to community ownership. Since being founded in 2011, the Biodynamic Land Trust has secured over 300 acres of land for five farms including Huxhams Cross Farm in Devon. Thanks to public investment in Biodynamic Land Trust not-for-profit community shares, the land is placed in trust as community-owned ecological farms for generations to come. Good farmers produce more than good food. They also nurture the soil, wildlife, farm animals and people. At Huxhams Cross Farm, the land is springing back to life, thanks to the sustainability expertise of farm tenants, the Apricot Centre. Along with a band of local volunteers, the farmers are reviving the soil with biodynamic farming methods, have raised a barn, and planted over 3,000 trees and over 2,000 soft fruits plants. The farmers care for a flock of 100 chickens and two cows (called Damson and Daffodil), grow local wheat for local bread (for Grown In Totnes) and are part of Dartington’s pioneering agroforestry (trees for farming) project, not to mention hosting weekly farm clubs for local children and running a weekly food delivery service. Huxhams Cross Farm has got this far thanks to community investment. Now, the Biodynamic Land Trust invites further investment to build a multi-purpose centre on the farm. The low-carbon building will offer farm-to-fork cookery activities for children and adults, facilities to turn fresh excess produce into jams, juices and chutneys, training in permaculture and biodynamic farming as well as a base for the Apricot Centre’s well-being service for vulnerable families. In a society where profit often overrides values, investing for Huxhams Cross Farm is a vote for values. A charitable community benefit society, the Biodynamic Land Trust offers community shares for Huxhams Cross Farm, changing the world one farm at a time. Do you know you can also invest in community shares on behalf of others, including children? Investing in a community-owned farm has got to be a gift that goes on giving.